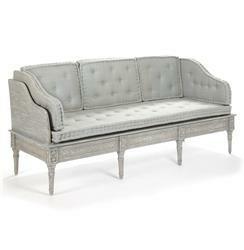 Delicately detailed, this long wood bench finished in dove grey is warm welcome in an entryway, porch or sitting room. Distressed upholstery adds casual elegance to this luxurious French Country focal point. Enjoy the elegant craftsmanship as you recline alone or share the settee with several friends or family.